I personally like to lift heavy at least twice a month. Why? 1. I like to see how strong I have gotten. It took me most of year to get to bench 255 pounds 1RM. 2. By lifting heavy I shock my muscles. 3. When I lift heavy I do a total body basic lifting by working out the whole body I utilize muscle confusion to burn more fat. 4. It’s inspirational to see how far I have gone. Example my Deadlift went from 135, 185, 205, 210 to 225! Let me extremely clear here. I don’t lift like this all the time. 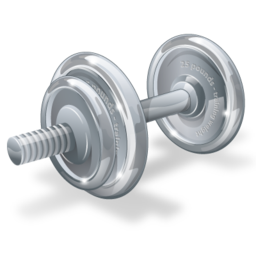 During a regular workout I lift a weight that I can complete 8-12 reps with. My Heavy Lift workout includes the following. All of the above are done with a 7foot 45lb.Olympic Weight bar. I pyramid the weight, which basically means I start at weight that I can do between 4-6 reps with and work up to a 1Rep Weight. I rest longer between sets 60-90 seconds giving my muscles a little bit more time to recuperate. Longer rest periods help grow muscle mass. My Heavy Lift workout takes about an hour and a half due to the longer rest periods. WARNING! Don’t try lifting heavy without acclimating yourself to the weight by a steady weight training progression. All of the above are done with a 7 foot 45lb.Olympic Weight bar. I pyramid the weight, which basically means I start at weight that I can do between 4-6 reps with and work up to a 1Rep Weight. I rest longer between sets 60-90 seconds giving my muscles a little bit more time to recuperate. Longer rest periods help grow muscle mass. Lifting 275 – This is the most I have ever benched. Let’s put it in perspective I weight between 167 and 170 depending on the time of the day. 275 is a 105 more pounds than I am. That is a lot!!! I did make a mistake I should have lifted 5 to 2 pounds more than my 1 rep max. Going 25 pounds more than what I am used to was not smartest thing for me to do. I could of pulled something or seriously damaged myself. Knock on wood nothing happen except for me being sore the next day. What happen during my attempt I was able to lift the weight off the clean bring the weight on the negative to my chest. On the way back up to the clean just 5 inches away to doing one rep I couldn’t do it! Complete muscle failure I had to bring the weight down to the safety spotters and do a quick set of 255 two reps. Even though I didn’t complete the rep I did see how far I could go. This was a incredible spirit and confidence boost. So lifting heavy I say it’s up to you, it does have its benefits. Be smart about it, build up to your 1 rep max you will be surprised how strong you are.